Sing up a storm in your next audition! We thought it was about time we shared some of our secrets for getting our clients into West End roles, televised competitions and film musicals. 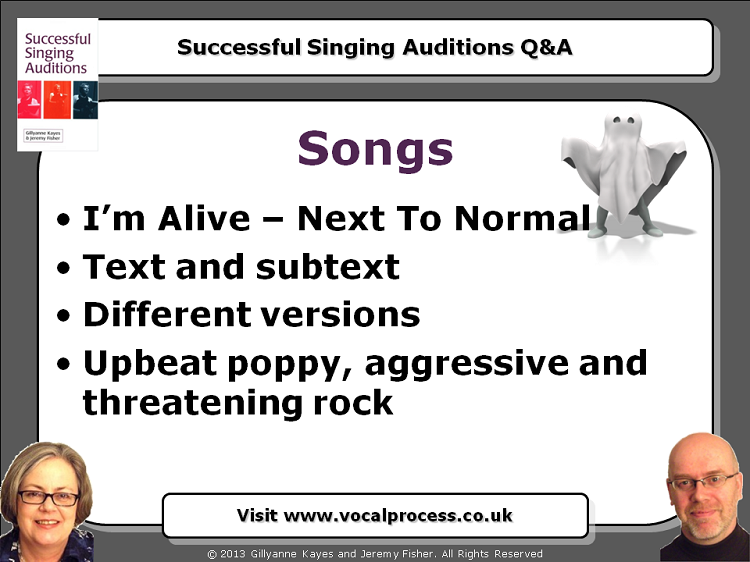 So in our latest Webinar Replay we take four songs and analyse them in detail for vocal technique and performance issues in exactly the way we would do for our private client coaching sessions. 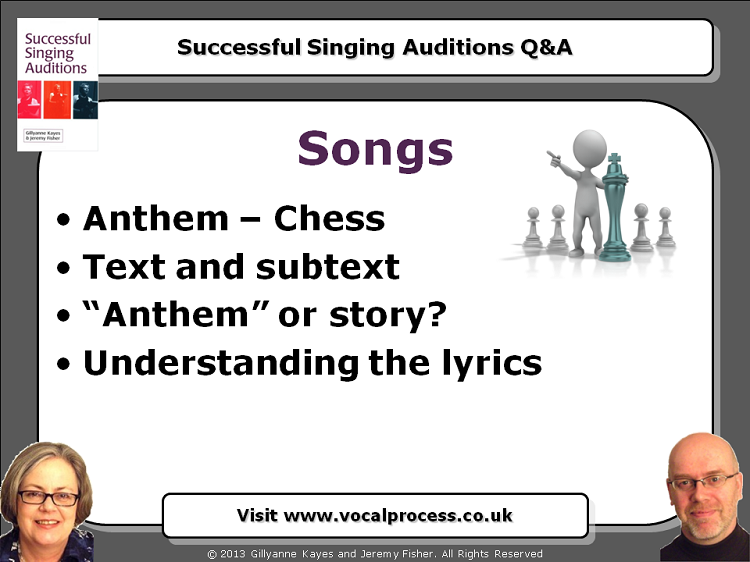 These four songs are used in Music Theatre auditions around the globe, and regularly appear in our Successful Singing Auditions masterclasses around Europe. We examine each songâ€™s plot, the text, and suggest several ways of cutting the song for audition (the short versions and different 16 bar versions). We look at the characterâ€™s subtext and how you can change it to change the performance of the song, and we point out the potential pitfalls in each song for the performer. We show you how we choose songs for dramatic AND musical style, and give you 16 examples of songs with different dramatic weights and musical styles, from Little Mermaid to Bare. What do I do when I hear someone else sing my song? And youâ€™ll discover the golden rule for you and your music that you break at your peril! How much can I move? Thereâ€™s a practical solution for bringing the appropriate level of movement into your auditions, whether you're a static person or the possessor of windmill arms. And the weblink to the streaming video is on the first page of the pdf. You can watch the video online at any time of day or night, pause and rewind it, or repeat it at your own pace. 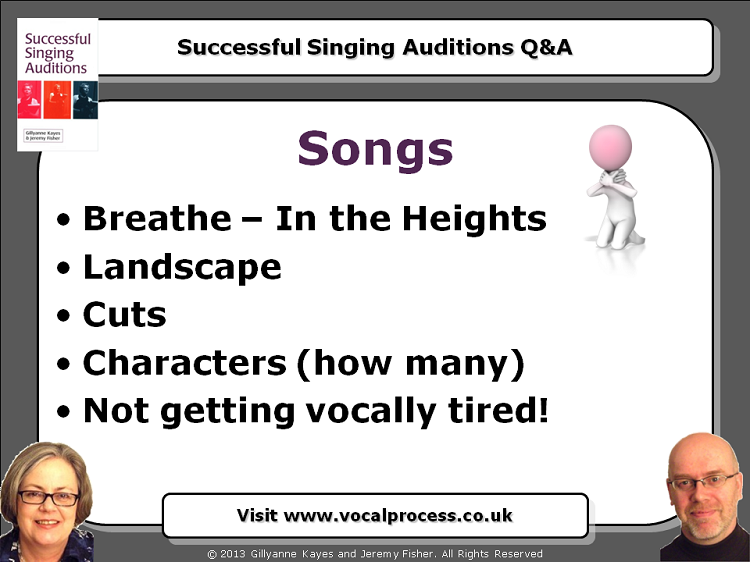 So, if you want to get tips for singing better in auditions, if you want to find out why our clients are consistently recalled for jobs and film roles, and if you want to know why they get onto the televised rounds of singing competitions, get this Webinar Replay now and stay ahead of the game.